b: you won’t like this curry. It tastes of beetroot. For those of you still here, this is a rather special curry. One of those where the taste lingers long after in the mind. In fact, I was dreaming of this dish the day after I made it, keen to cook it again at the soonest opportunity. 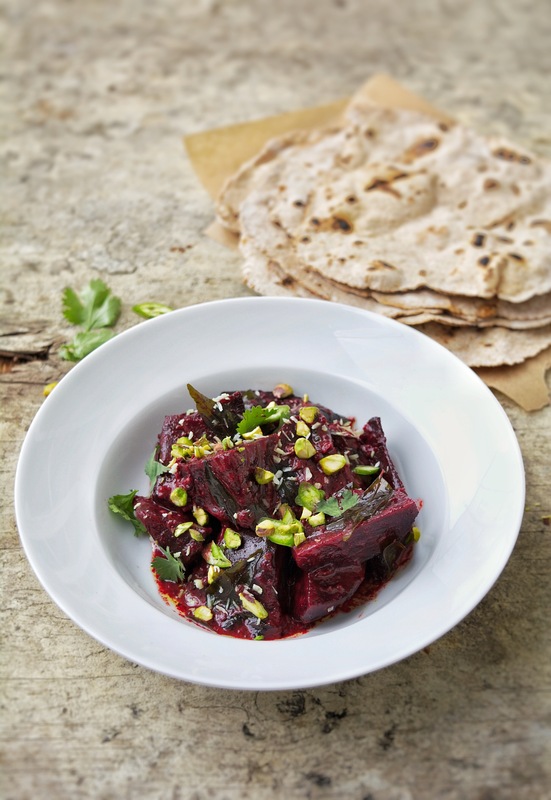 It’s rich, soothing, earthy, firey (and possibly windy), and the dense texture of the beetroot is quite unusual in that the in the curries I usually have, the main ingredient is soft, tender long cooked meat that falls apart, delicate prawns, or meaty fish. This has bite. And the sauce… dredging the chapatis through the deep burgundy velvet is an indecent event. I’d stress the importance of fresh curry leaves. Don’t bother with dried ones really. At the very least, use fresh curry leaves you have frozen (which they are very good for). I normally buy quite a few bags and keep them in the freezer just in case. They are so distinct and have such a recognisable aroma when they hit the hot coconut oil in the pan that they immediately hit my memory button of being in Sri Lanka. You can use the base of this curry with prawns if you like and it will be delicious. But please, try this one. You can have a prawn curry any boring old time. Heat the coconut oil in a large wide pan and add the mustard seeds. When they start to pop add the cinnamon stick and onion. Stir well, season a little and cook gently until the onions start to soften and turn golden. Add the turmeric, coriander, garlic and ginger then stir in the curry leaves. Add the chillies and beetroot, stir well and cook for a few minutes. Pour in the coconut milk and mix well. Bring to the boil then turn to a low simmer and cook for about 45 minutes, turning the beetroot occasionally so they cook evenly and the sauce reduces and thickens. Mix the flour, salt, garam masala and water together in a bowl until it forms a dough. Knead for a few minutes then divide into eight balls. Heat a cast iron skillet until red hot and thinly roll out a dough ball into a circle. Cook it in the dry pan until it starts to bubble up. Flip it over and cook until the other side bubbles. If you have a gas hob, finish each bread directly on the flame for about 20 seconds, they puff up really well and char a little. Repeat until you have used all the dough.